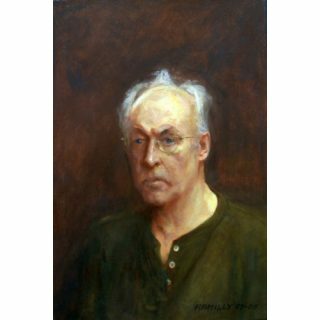 Paul Rahilly was born in Boston, Massachusetts, in 1933. After earning his B.A. in Mechanical Engineering at Tufts University, Medford, MA, he moved to New York to study at the Art Students League. He earned his M.F.A. in 1977 from the Massachusetts College of Art, Boston. 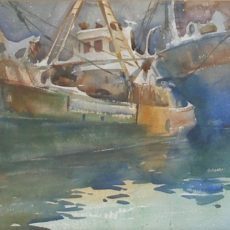 Since 1966, he has held several teaching positions at several institutions, most recently (in the last twenty years) as an instructor in Painting and Drawing at both the School of the Museum of Fine Arts and the Massachusetts College of Art, Boston. Paul Rahilly’s work has been featured in group and solo exhibitions at galleries and museums outside of Boston, including New York, Chicago, and San Francisco. The Greenville County Museum of Art Greenville, South Carolina recently mounted a solo exhibition of his work. Less a classicist than a modernist, Rahilly’s vigorous brushwork and often impressionistic style has little in common with the illusionism of trompe l’oeil. Instead, he incorporates both realism and abstractions of the natural world, while offering us complex visual experiences in his sophisticated compositions of lusciously applied paints.